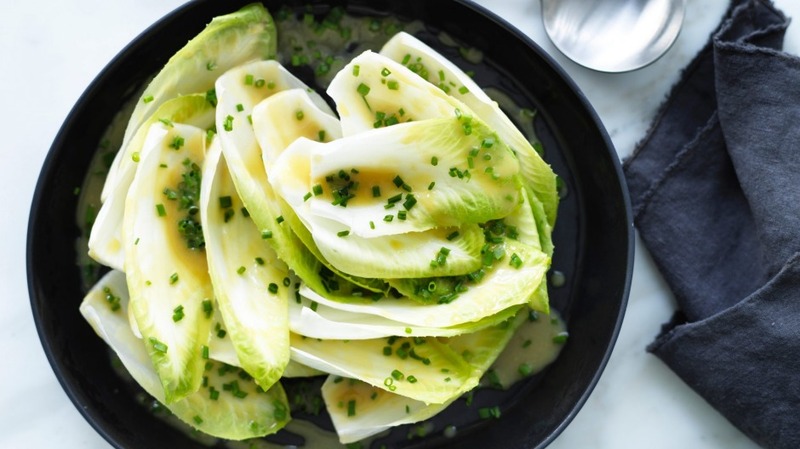 I do like the subtle bitterness of the endive, but the endive can be replaced with butter leaf lettuce. This slightly sweet mustard dressing works a treat alongside my comte tart. 1. Pick the leaves from the endive, wash the leaves in cold water and spin or pat dry. 2. Whisk the mustard, sugar and vinegar in a mixing bowl. Slowly drizzle the oil into the dressing as you whisk to emulsify. Season with a pinch of salt and white pepper. 3. When you wish to serve the salad toss the leaves and the chopped chives in the dressing to coat the leaves evenly. Serving suggestion: alongside Andrew's comte cheese quiche.